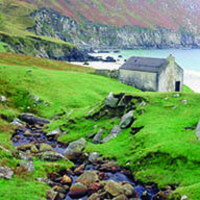 Study abroad during summer 2019 on the Wild Ireland: Literature and the Performing Arts program in Galway, Ireland. Immerse yourself in film and the arts, attending both the Galway Film Fleadh and Galway Arts Festival. Explore the Irish west from the lively and historic Galway town, including a visit to the Aran Islands. Study Irish literature from the classics of W.B. Yeats and J.M. Synge to more contemporary writers. Come to the info session to learn more from William Kerwin, faculty program director.